Pileta de Prehistoria calls my attention to this beautiful figurine of an elk carved in amber found in a farm from Northern Germany (exact spot not specified anyhwere). The artwork seems to belong to Federmesser culture, sometimes described as part of the Azilian culture (Epi-Magdalenian in any case), that overlapped in extension the more locally rooted and technologically distinct Ahrensburgian culture. 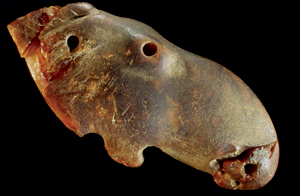 S. Veil et al., A 14 000-year-old amber elk and the origins of northern European art. Antiquity 2012. Pay per view ··> LINK. Main source: About.com – Archaeology: Art of the Azilian: 14,000 year old Amber Elk Figurine. The engraved schist plates have been found concentrated at a dig site at Meirinhos[pt] (Mogadouro, Alto Trás-os-Montes), where they seem to have accumulated by the action of natural forces back in the day. Their motifs are mostly figurative, although some are zoomorphic (horses, aurochsen). 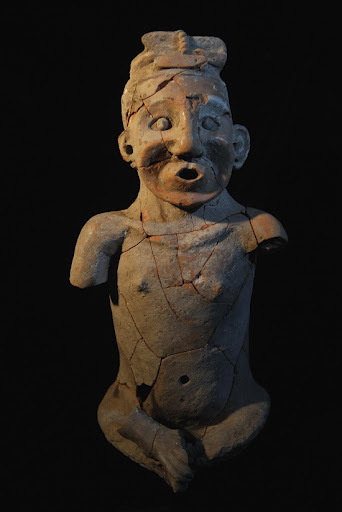 They are believed to be from the Upper Paleolithic and are among the most important artistic sets of NW Iberia (also Côa open air sanctuary and Asturian cave art). Barbara Purdy et al., Earliest Art in the Americas: Incised Image of a Proboscidean on a Mineralized Extinct Animal Bone from Vero Beach, Florida. Journal of Archaeological Science, 2011. Pay per view. A fragmented fossil bone incised with the figure of a proboscidean was recently found at Vero Beach, Florida near the location where Late Pleistocene fauna and human bones were recovered from 1913–1916. This engraving may represent the oldest and only existing example of Terminal Pleistocene art depicting a proboscidean in the Americas. Because of the uniqueness, rarity, and potential antiquity of this specimen, caution demanded that a variety of tests be used in anattempt to verify its authenticity. The mineralized bone was identified as mammoth, mastodon, or giant sloth. Rare earth element analysis was consistent with the fossil bone being ancient and originating at or near the Old Vero site (8-IR-9). Forensic analysis suggests the markings on the bone are not recent. Optical microscopy results show no discontinuity in coloration between the carved grooves and the surrounding material indicating that both surfaces aged simultaneously. Scanning electron microscopy (SEM) revealed that the edges of the inscription are worn and show no signs of being incised recently or that the grooves were made with metal tools.In addition, the backscattered SEM images suggest there is no discontinuity in the distribution of light and heavy elements between the scribed region and the surrounding bone indicating that both surfaces aged in the same environment. This is very different from an intentional mark made on the bone for comparison. Energy dispersive x-ray spectroscopy (EDXS) shows that the surface contains significant amounts of calcium, phosphorus, oxygen, and carbon typical of a mineralized bone surface. Examination of a cast and mold of the incised bone by Reflectance Transformation Imaging (RTI) also provided no evidence that the engraving was made recently. All of these results are consistent with the mammoth engraving being authentic. I also found an available PDF (not sure how long it will stay open). It definitely derived from a much larger land mammal than any known to have been alive in Florida during the Precolumbian Holocene interval (e.g., bear, bison, deer), and the great thickness of the cortical bone precludes a cetacean origin. Because the bone is mineralized, it is improbable that it can be identified by DNA analysis or dated by 14C. This is usually the case for Late Pleistocene fossils from Florida (e.g., Hulbert et al. 2009).